On the 8th of August, HYIP called ErTravel has joined Standard listing on the DavidNews.com monitor. In total, it has been already accepting deposits for 25 days. It’s a program with the registered UK company. If I wouldn’t know that it’s a HYIP then most likely my first thought would be that it’s a travel company. Now I have reinvested $200 in this program and will follow the development of this program in the following days. However, let’s examine the information available about this program and see if it can be potentially beneficial. Keep reading to find out more. What comes to your mind when you hear words like a vacation or traveling? I think about one of those classic beach images taken on a sunny day with the blue skies and water. Even, though ErTravel admin has chosen different images for the home page, these images are there to give you a certain impression of the travel-related business. What exactly does ErTravel and how they are planning to earn the deposit for potential investors? After taking a good read on the company biography page all I can tell you is that admin claims that company is providing travel services to uncommon and exclusive destinations. Unfortunately, it’s hard to follow the logic of travel services and a HYIP. At least, the Investment plans have names of the certain locations, which might be attractive for a potential investor. The plan called Paris looks somehow out of the context here, because it looks more available for the average guy living somewhere in the Europe. More about the investment plans in the following paragraphs. Admin has located the company registration details on the biography page. The company is called Ervant Travel LTD and has been incorporated on the 24th of April. The company address on the website of ErTravel and Companies house company registrar are not similar. Probably, the company has already changed the office since the April. On the website, we see it’s located in London, but on the companies’ house registrar (service for checking the registration details) – Birmingham. The website layout is very simple and covers all major topics, which usually we can find on the HYIP websites. 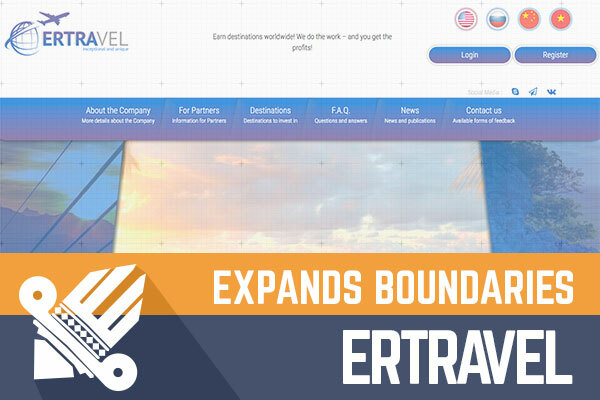 In my opinion, a large part of the homepage has been wasted using huge images instead of company slogan or something else, which indicates what exactly is ErTravel offering us (about the company or investment plans). Another thing is that affiliate program rates are located before the information about the investment plans. I already have a rhetorical question if affiliates are the main audience of this project. Most likely the website has been built using a template with content in Russian or it’s the main language. On the homepage, you can see the information about investment plans and buttons with labels in Cyrillic right next to them. At least, google translate says it’s Russian. This program seems interesting due to the limited amount of available deposits for certain plan. Of course, it gives you an urge of a limited offer. Unfortunately, there is the downside of it – desired investment plan can be no longer available for a deposit while you complete the registration form and add the money to your wallet. Therefore, don’t take the investment plans for granted before you have added the balance to the wallet. Since I have mentioned the wallet, I would like to point out that like other programs, here you need to make to steps to make a deposit. First, add balance via PerfectMoney, Bitcoin or AdvCash. Second, choose the deposit plan or several plans to deposit the money from your wallet. There are plenty of HYIP’s with such two-step approach. However, I believe it’s worth mentioning to avoid any confusion. Most of the currently available deposits have “Non-refundable” deposit, which means that initial deposit is not returned at the end of the deposit term. The only plan with refundable deposit is Fuji, which currently is not available. Another thing to keep in mind about deposits – withdrawal process is manual and can take up to 24hours. At the moment, there are five different plans available with rates starting 3.88% day and up to 5.45% a day. Deposit terms vary from 22 to 40 days. As I mentioned earlier, the deposit is not refundable for most of the plans. For example, $200 deposit in the plan Paris would make a $10.9 a day and after 22 days revenue would have covered the deposit fee and made a profit of $39.8. There are also other plans available for a shorter deposit periods, which means that there must be people that have completed one of the investment plans and could share their thoughts about the program or plan. Please drop a message in the chat box in case you are one of them. I see a potentially beneficial program with a website, which gives me a feeling of a quick job. This feeling didn’t leave me also after opening the dashboard for registered users. In my opinion, the legend is also very weak and it’s hard to follow the connection between the tourism company and the HYIP. Of course, it might have no impact on the performance of this program, but it also might indicate the short-term approach. The program must have finished investment cycle for at least one or two programs. Please share your experience in the chat box if you have already invested in the program. As usual, I’m here to gather information, which is available out there on the web and decisions about the potential investments are totally up to you. Therefore, if you ever decide to make any investments, don’t invest more than you can afford to lose! Investment plans: 3.88% up to 5.45% daily for 22 up to 40 calendar days. Ignore other investment plans.